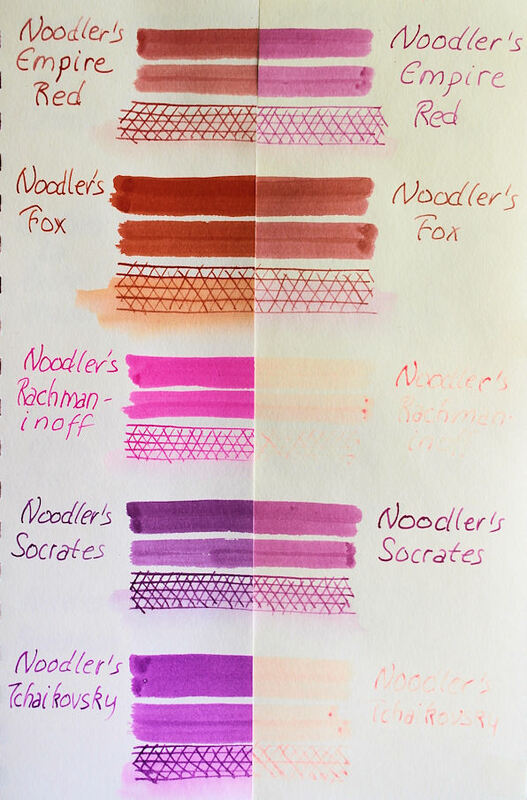 Last year, I began some lightfastness testing on the full line of Noodler's Eternal Inks, as well as pigmented and iron gall inks by other brands (Sailor, Rohrer & Klingner, Diamine, and Platinum). 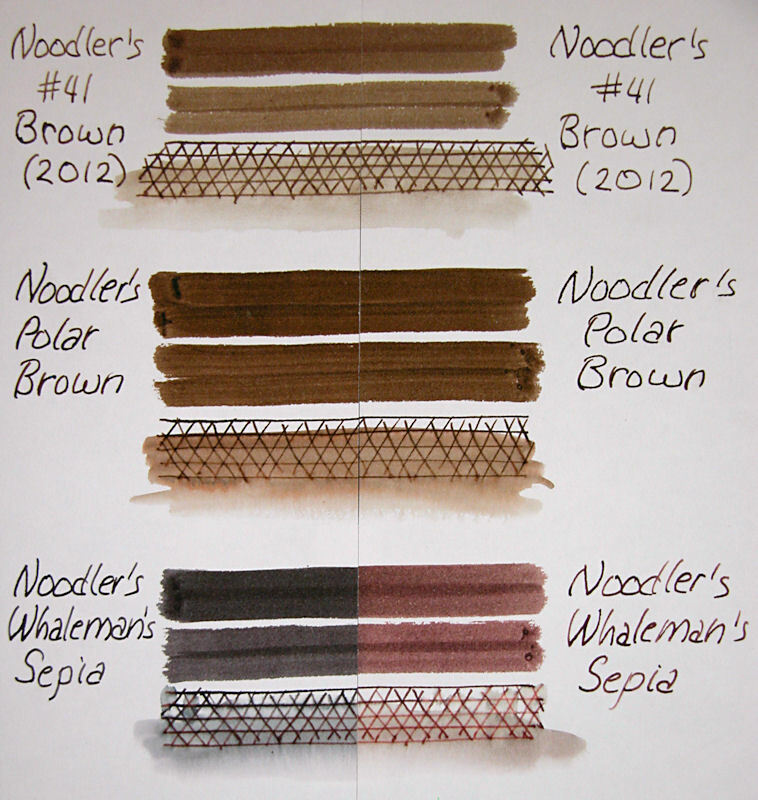 This was done in collaboration with Brian Goulet of the Goulet Pen Company. 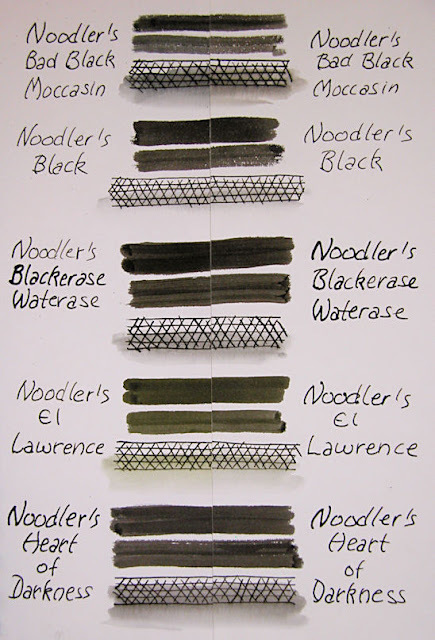 Brian was interested in providing information to his customers, and I was interested in learning which inks would be best to use for assorted art applications. 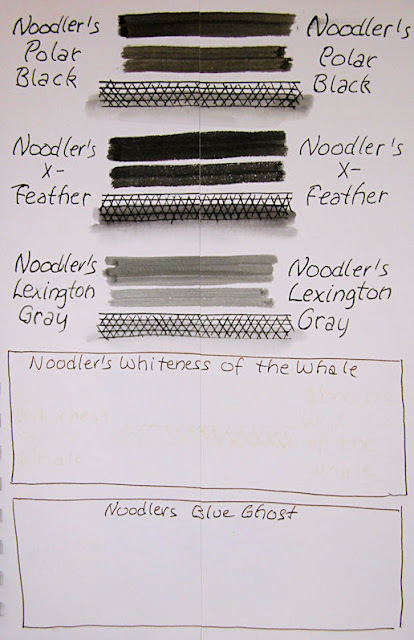 You can click here to see how I set up the test sheets. It is now many months later, and the results are in! 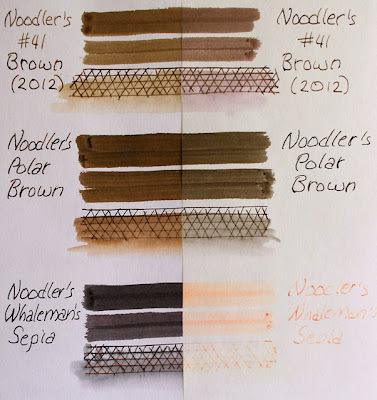 I tested 41 eternal, pigmented, and iron gall inks. 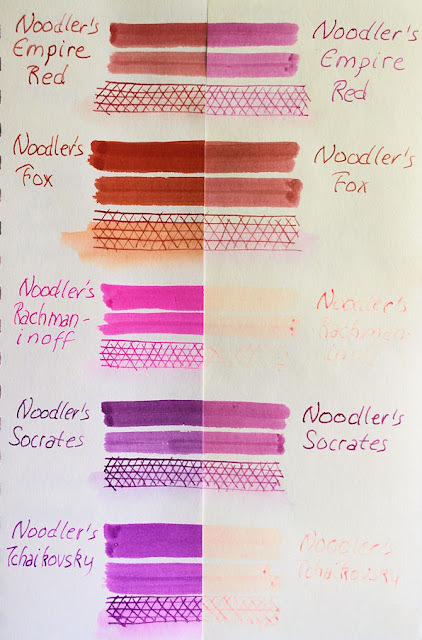 There are another 45 or so inks that I tested at the same time, which do not fall into those categories, and I will discuss those briefly here as well. 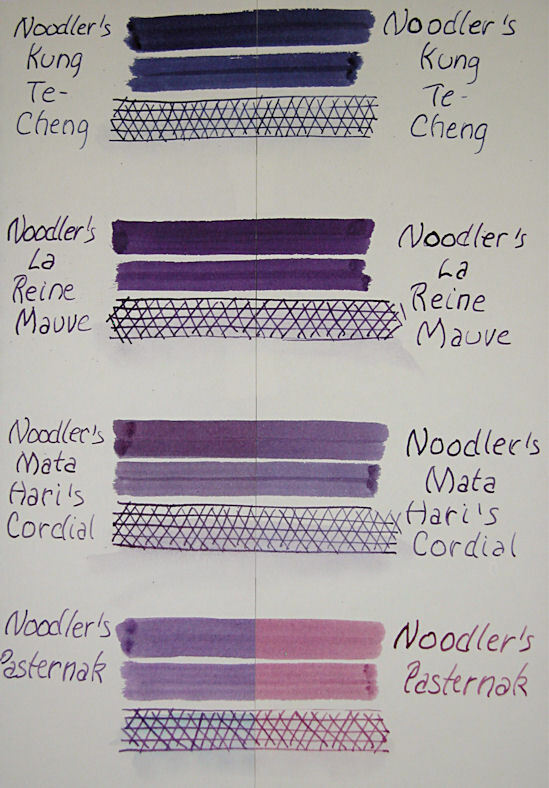 Before I go into the results, it is important to note that terminology varies between fountain pen folks and artists. 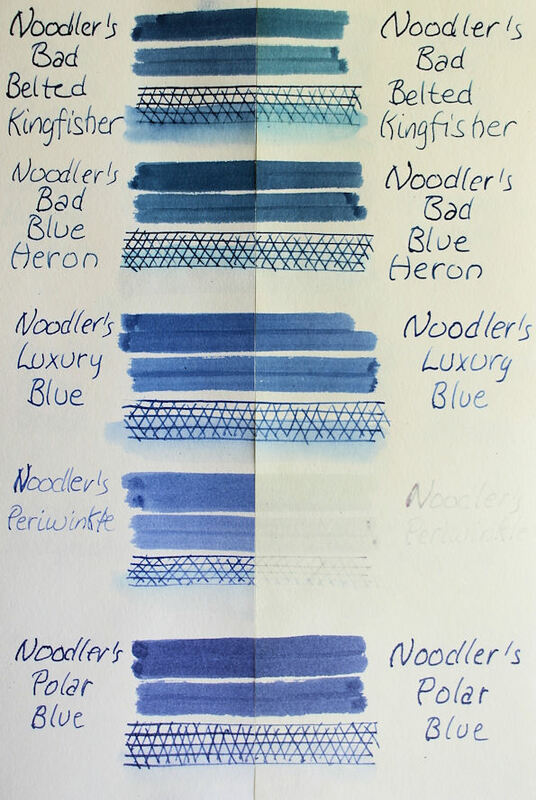 No fountain pen ink is expected to live up to archival standards in art materials terms. These inks are not designed to be lightfast when exposed to UV light. Brian and I both faced this test with low expectations, which were, for the most part, confirmed. That being said, there were some inks that held up better than expected, and others that did surprisingly terrible in their class. 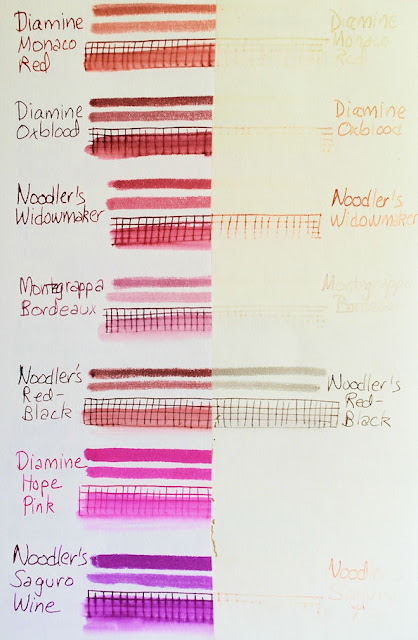 Also, ink manufacturers sometimes make changes in color or composition of their inks between batches, so the results you get may be different from mine. 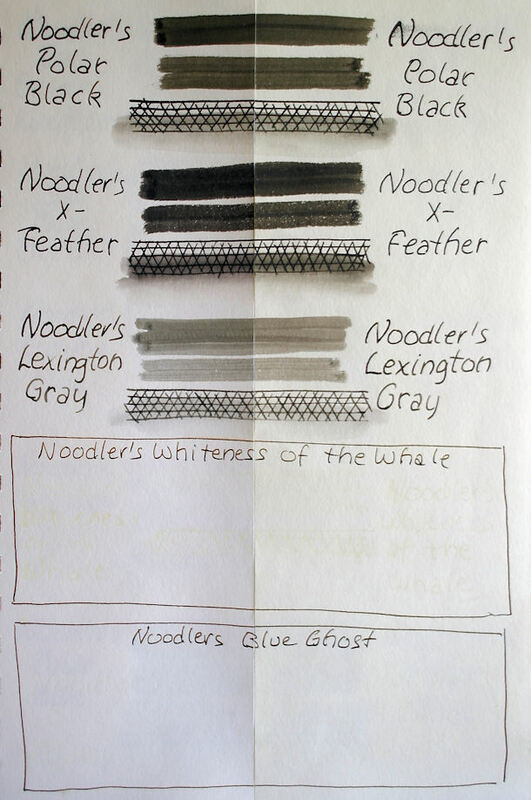 For example, Noodler's Lexington Gray performed much better this time than a sample of it that I'd tested a couple of years ago. The third tier is basically everything else. 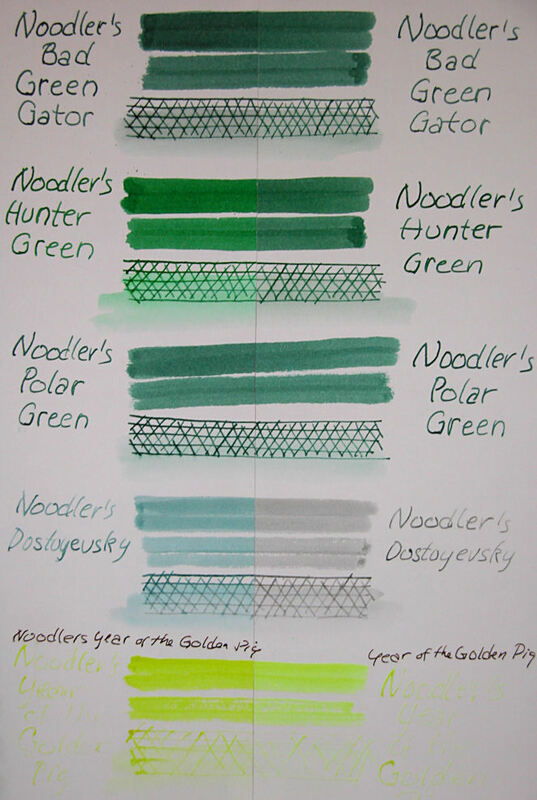 These inks either had a huge color shift, faded a lot, or in some cases, nearly vanished. Below are the photos, so you can have a look for yourselves. Artists who are interested in knowing which inks can create a wash, and the color of the wash, will be able to see that in the samples. 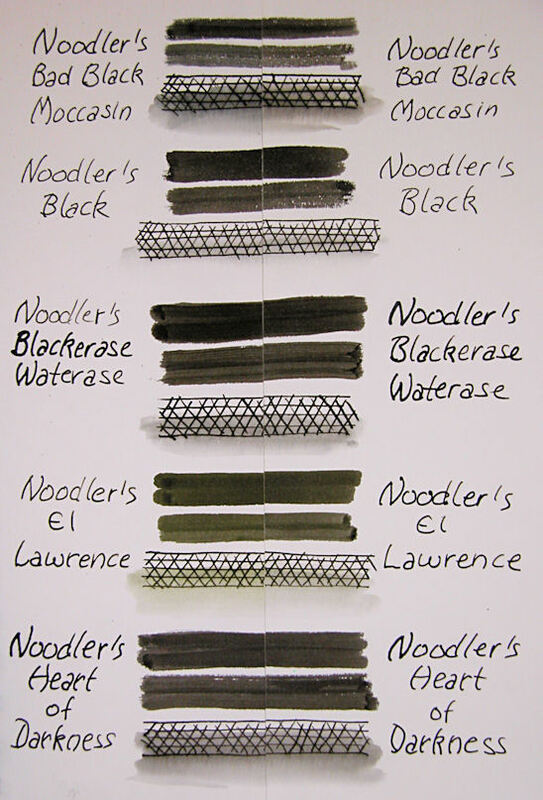 That washed area is generally where changes first appear, since there is a thinner application of the ink there. The six week and five month photos were taken with different cameras and different light sources, but you can still do the comparisons on each page. You can click images for a larger, clearer view. One thing you will notice is that due to the optical brighteners in the paper, the UV light caused the paper to yellow a bit by the five month mark, even though it is archival paper. The control side is on the left, which was kept inside a sketchbook. The right side of each page was in the window. I then taped the pages back together to photograph them. It's much easier to make the comparisons with the sides together this way. If you have a favorite ink in this test group, be sure you look at both the six week and five month samples! 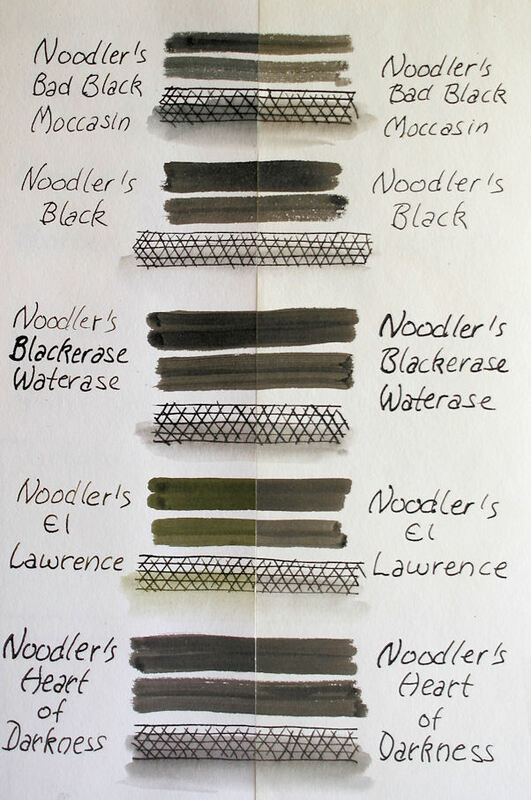 Remember that some inks that showed little change in six weeks had huge changes just a few weeks later. All images are clickable for a larger, clearer view. 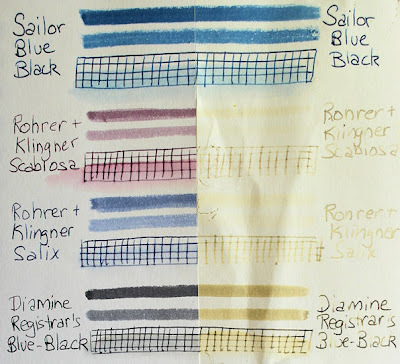 That was it for the Eternal, iron gall, and pigmented ink samples I had for testing. If you found some of those results discouraging, you'll feel better about them once you look at inks that don't fall into those categories. I didn't even photograph most of those, because for the most part, they nearly vanished. 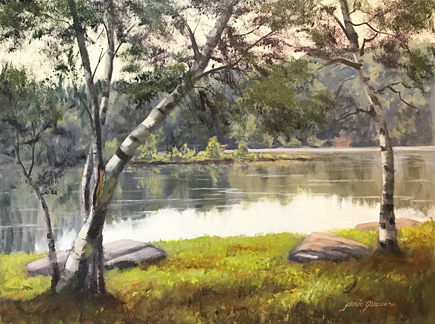 Below are two examples. Thank you all for your patience in waiting for these results. It took a long time to get these all done and photographed, adjusted, and posted. I hope it was worth the wait for you, and that you find this information useful. 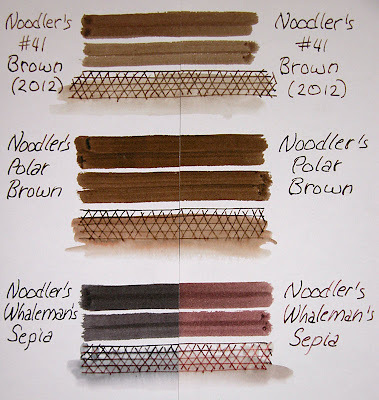 It's been interesting for me to see how some of my personal favorites have fared, and as an artist, I now know more about which inks I'd use for what applications. Thank you! Thank you! You are a kindred spirit. 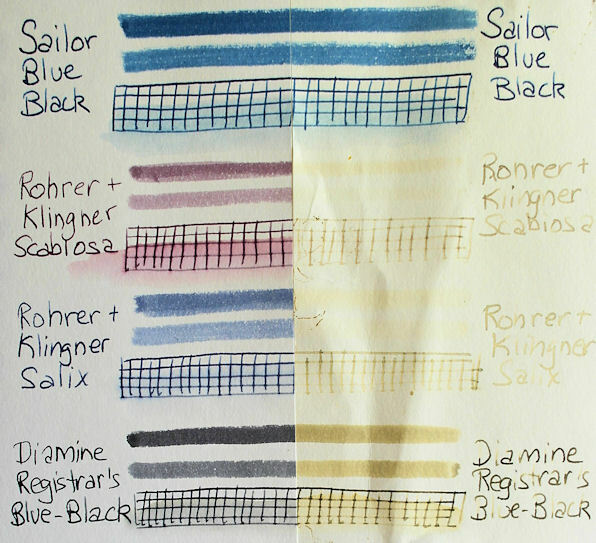 Almost every ink or throw away pen I use I test on a sunny windowsill. Here the work is all done for me. This is good info to be aware of. Thank you. Very helpful, Jamie. Thank you! Christian, I'm glad you found this helpful. 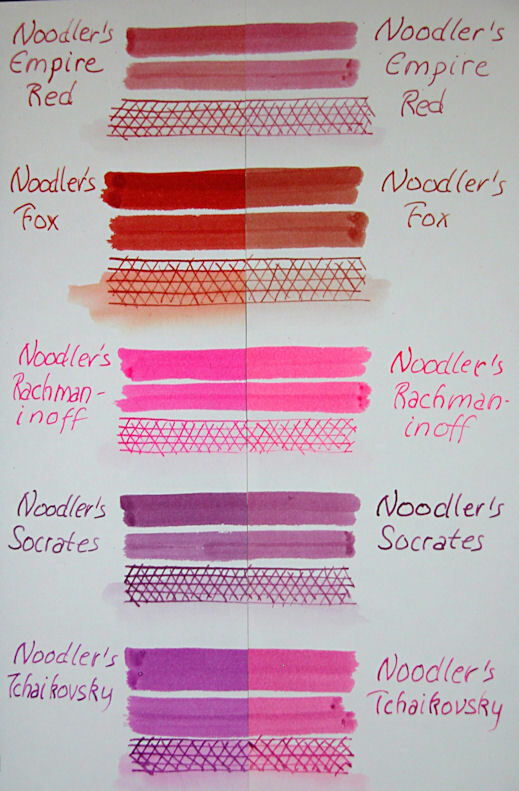 However, I think I need to state that I have not proven lightfastness for any of these inks. That would require testing way beyond my capabilities. All I can do is say what happened in my own window during this relatively short period of time. By archival lightfastness standards, this is not very much time, nor a very scientific approach. 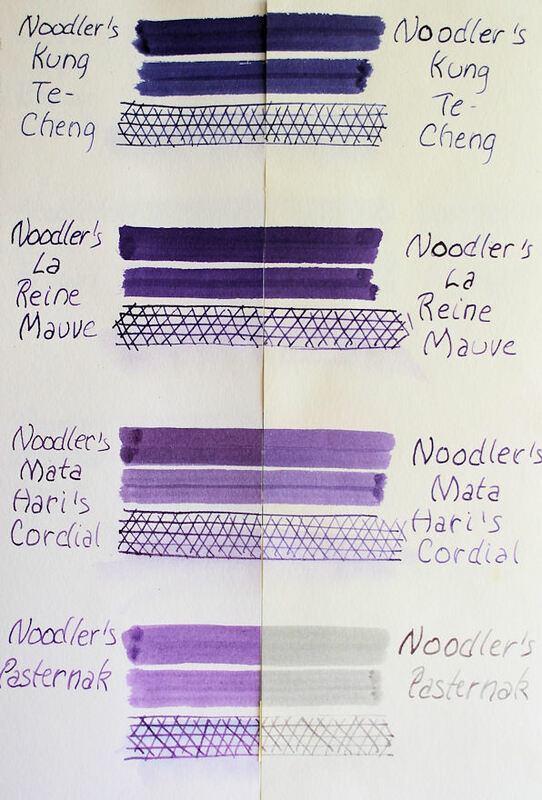 It was done for my own purposes, more to see which inks would fade more quickly rather than to prove the others would not fade at all, ever. Please consider these results to be relative to one another, and not an indicator of archival lightfastness by artist or ASTM standards. Those would be much more rigorous tests over a longer period of time, and with superior controls than I have at my disposal. While your tests were not rigorous per ASTM standards, they are far more than many of the ink manufacturers attempt to do. Your tests were both informative and helpful. We would all love to see the results of more detailed testing. But in the absence of such testing, your effort is both appreciated and informative. Thank you! I just found your UV test today after going through some old Goulet Pen email (I'm try to catch up). You might want to look at my own UV test which I posted at the Fountain Pen Network. 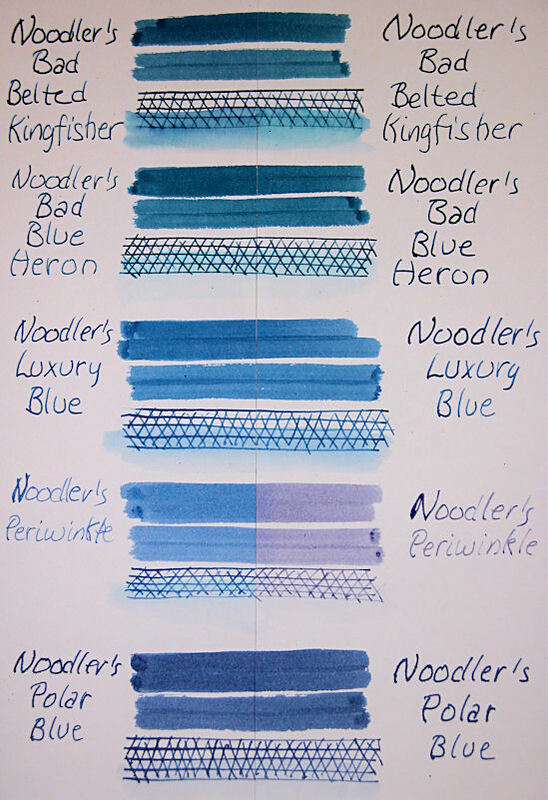 These were all 'fountain pen' inks, not artist inks. Here in the SW USA, UV is high and sometimes we even get ozone. Most of the tests out there are for waterproofness so nice to see I'm not the only one worried about fading. 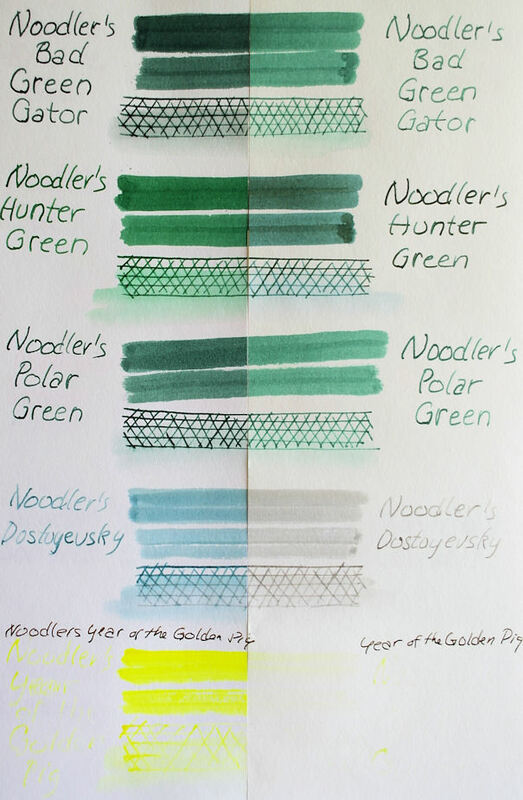 I have come back to this page over and over for the past year as I evaluate inks. I really appreciate the work. One question -- did you look at the blue ghost under a black light after the test? If so, how did it fare? This is great. You've really opened my eyes, which are important because I use the inks for drawings that hopefully will end up on walls some day. 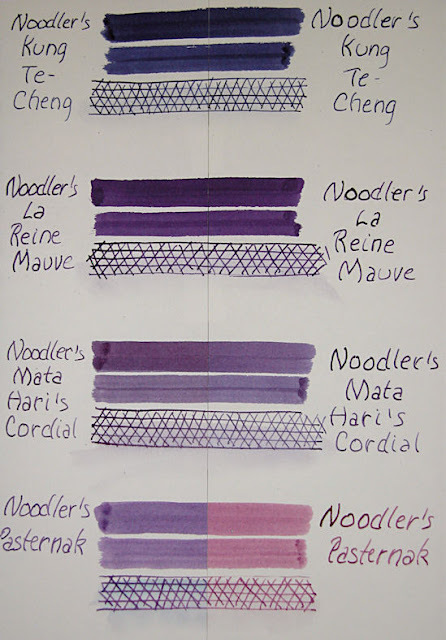 I just assumed that the fountain pen inks would be as light resistant as my India inks. Most ink reviewers out there doesn't even mention light resistance, instead they pour bleach and stuff on it... I guess because it's easier to test. 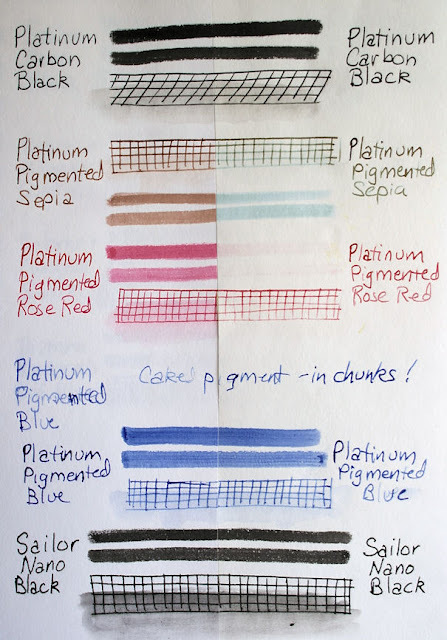 I'm quite shocked that not even Diamine Registrars had better light resistance. 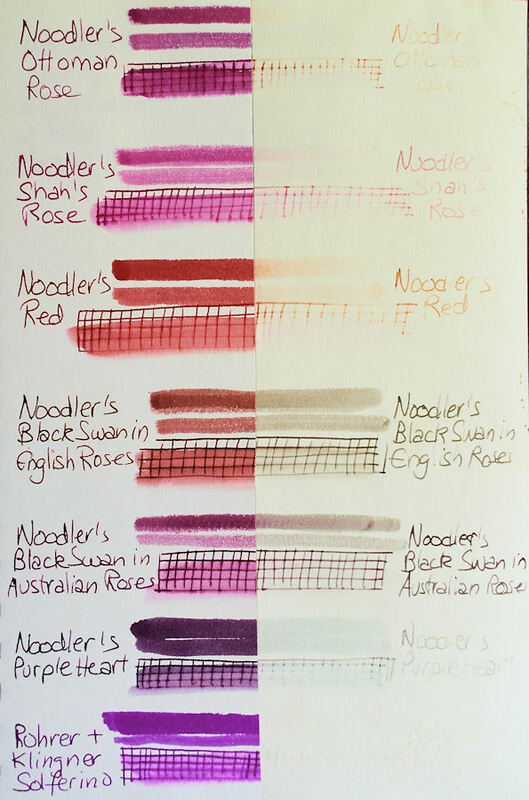 The sad thing about this is that Noodlers and Platinum, which seems the best options, is quite hard to come by where I live in Europe (I'm from Sweden). I can order them from UK (or US I guess), but will have to wait for next paycheck ;) I've found a india ink that should work for me meantime though, Pelikan Fount India. There is a also one shop in my country which carry Sailor Nano inks. 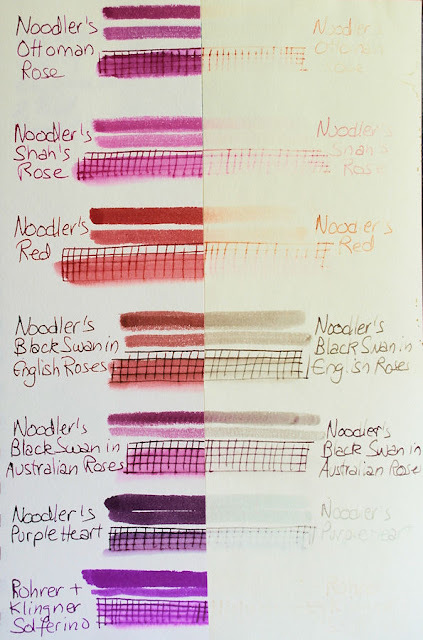 Even if your test is not scientific it is incredible helpful for artists! 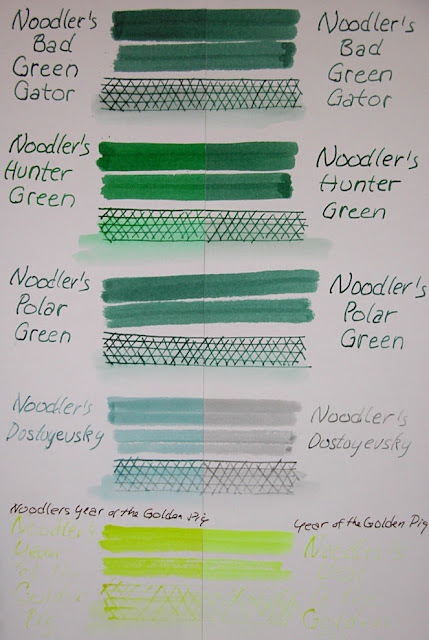 While lightfastness is an issue for artists (most art media have ratings for this), ordinary ink is typically purchased for its appearance or color. If one plans to record important information for posterity, lightfastness AND the quality of the paper (or whatever is written upon) is an important consideration. The ancient Hebrews actually wrote on metal plates for the preservation of the most important information. A bit beyond our budget! As far as science goes, a simple test is often sufficient for the inquirer. It would be a plus if companies who sell inks would include the affects of light in their product data. Our sun is giving off much stronger UV and other radiation now, leading to premature failure of many materials. This might seem odd coming out of the blue in 2019, but thank you for these tests. 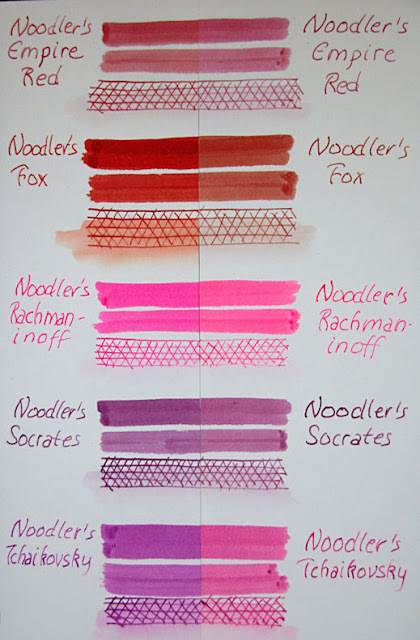 Someone mentioned them in an Amazon review and you saved me from the future purchase of a non-archival ink.